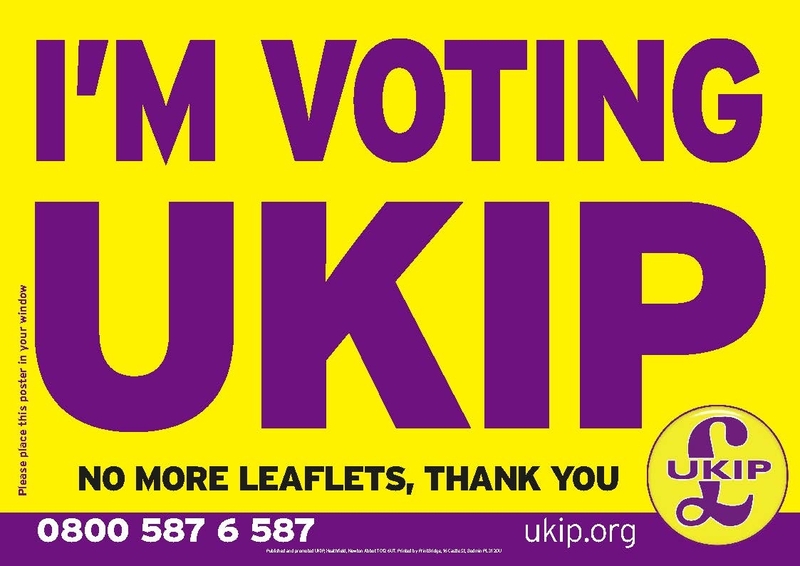 VOTE UKIP! ARE YOU CRAZY? Well, yes actually, and that’s the great thing about the United Kingdom Independence Party (UKIP). UKIP embraces crazy, in the non-clinical sense of the word, of course. UKIP embraces that crazy which is defined as ‘extremely enthusiastic’. This is just a quick post a propos nothing much at all really, other than that the minor political parties have been in the news a lot lately as the politicians and the media grapple with the prospect of televised debates in the run up to the General Election. To vote UKIP is to vote for a number of things: democracy itself (offering a choice which is different to the homogenised mainstream political parties); British eccentricity; common sense (spectacularly absent from the homogenised mainstream political parties); legitimate dissent (from the homogenised mainstream political parties); political incorrectness (absolutely prohibited by the homogenised mainstream political parties); freedom of speech (a source of great discomfort within the homogenised mainstream political parties); the norms, values and beliefs of a huge swathe of British society, largely ignored and often despised by the homogenised mainstream political parties. UKIP is the politics of neither the Left nor the Right. UKIP is the politics of traditional Libertarianism: the politics of the ordinary citizen being rightly wary of the Establishment and the State and their associated elites. This isn’t about being chippy. For the past 25 years or more the British public has been on the receiving end of systemic political deceit and ineptitude. Peter Oborne coined this as ‘The Triumph of the Political Class’ (worth reading). Our political class has brought upon itself the marvellous legalised anarchy that is UKIP. That’s why the political and media Establishments are in a flat-spin about UKIP, and increasingly indeed are fretting like hell about the Scottish National Party and the Green Party. No bad thing. Perhaps democracy’s being reinvigorated for the next British General Election? For the past 25 years or more the British public has been on the receiving end of systemic political deceit and ineptitude … yeah in fact far longer but exactly how do you get 25 years back with payback? A person only lives so many years and once that time has passed it can never be reversed or corrected. Game, set and match then never voting again EVER for no party when all that is political UKIP or any other supposedly new parties will be bought and corrupted to maintain the current system. That is the UK electoral system in full and not changing anytime soon because to change it would require more guts than the British population currently owns. THIS BIT CROMWELL NEVER RESOLVED. People would then use this argument against me that you deserve all you get? Really so if attacked politically and through policy does not a full scale blowback become justified? You say NO, I say YES this is the democratic right begotten to me as a human being and is not given by any political class or society I already own it. In fact by the intial sentence in this part any retaliation is permitted as an equal gesture. The UK is no longer my home in my eyes and I no longer swear allegiance to it as it never gave me any allegiance to begin with and never a home. Looks like your comment was corrupted in some way there bobanddonna? All set to give you several rousing cheers on your latest, but keep getting the dreaded “Page not found” message. CCHQ is after you, mate! Apologies for the technical glitch, Archie; normal service resumed.